This is one hell of an award-winning restaurant that has continued to impress even our Lee Family. Apparently sometime in 2007, Chef Santaro was given the greatest honour of cooking for Minister Mentor Lee Kwan Yew, who is fondly regarded as the father of Singapore. You can see our Prime Minister’s family pix on the walls of the restaurant & Chef Santaro also visits their home to cook for the Lee family. I was introduced to this restaurant many years ago while I was working for a Japanese organization. We would often entertain our guests at Santaro at their old premise in Fort Canning. They’ve since moved to a more convenient location in a business district – at the Amara Hotel. I was there for lunch with a Japanese ex-colleague. I’d the Combi Lunch Course @ S$40, which includes 2 items from the main, an appetizer, chawanmushi, salad, rice, soup & dessert. While waiting for my course, I’d always order my fave Oyster Mentaiko (カキの明太子焼き) @ S$12/piece. This Grilled Pearly Delicacy is not on the menu; you’ve to request for it but you won’t regret your choice. Despite being put into the griller, the Oyster still comes out fresh & juicy. 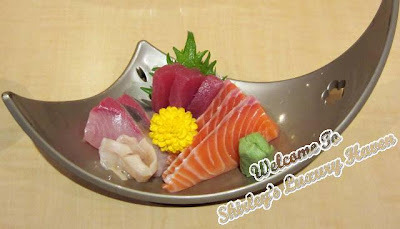 The Assortment Sashimi I had consisted of the Maguro Tuna(黒鮪), Hamachi Yellow Tail (はまち), Salmon（生鮭) & Geoduck (ナメガイ). It’s the 1st time I’m eating Geoduck raw. Errr….. I’m learning to appreciate the “rubbery” texture, but the rest of the Sashimi was superb! I’m a big fan of Mentaiko (明太子); it’s actually marinated Pollock roe & is a common ingredient in Japanese cuisine. The Oyster Mentaiko wasn’t enough for me, so I’d selected another Mentaiko dish - the Gindara Mentaiko (銀鱈の明太子焼き). The Cod fish was covered with generous helping of the spicy roe, making me salivate with every bite. Do you like Matcha ice-cream? What other Japanese desserts do you like to end your course with? Japanese food is a favorite of mine! i'm a big seafood lover and believe that fresh seafood is best be raw. it really brings out the natural sweetness and flavors. needless to say, this post is making me drool. love love love geoduck, but have never had it raw. looks like you had a great meal! The sashimi and oysters is my fav Shirley. Looks like a great place to try. I love matcha ice cream! And also the black sesame. Shirley, I've been to Santaro too & their food is good. I would love to have the matcha too. Lequan, great to have another seafood fan. It must cost a bomb to dine like that over where u are. Nava, do you cook Japanese too, or dine out normally? Shirley, love the spread. More pleeeeese! Penny, black sesame..... oh yes, love that too! Oh wow, everything looks so good...I wan't to go!